Ankara (Agenzia Fides) - A "Do ut des" that links the question of the theological school of Halki - an academic center connected to the Ecumenical Patriarchate of Constantinople, closed by the Turkish authorities in 1971 - to the solution of problems and legal disputes between the Greek institutions and community bodies of the Islamic minority residing in the Western Thrace. This is the card played by Turkish President Recep Tayyip Erdogan on the occasion of the visit to Turkey by the Greek Prime Minister Alexis Tsipras (who wished to meet Ecumenical Patriarch Bartholomew I on Wednesday 6 February at the headquarters of the former Orthodox Theological Institute, located on the island of Halki). 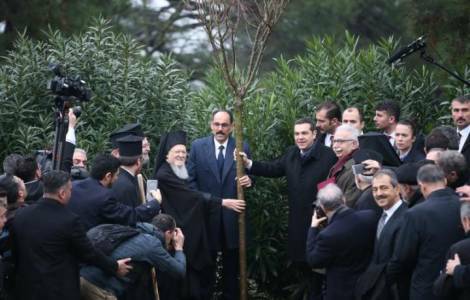 On receiving Tsipras in Ankara, Erdogan expressed regret for the closure of the theological school, but also denied any responsibility in this matter of the current Turkish leadership, noting that "it is not our fault, we were not the rulers at that time". Then, he added a personal memory, confiding that "when I went to school, the religion teacher sometimes took us there. There are so many books, there are about 38 thousand, can anyone read them all? I wondered….". Furthermore, Erdogan confirmed that the question of the possible and desirable reopening of the Halki Theological School is addressed to the Turkish authorities by all the Greek political leaders. "And whenever the question of the faculty of theology returns to the table - added the Turkish President -, when I am asked the question, I say: "Go to Western Thrace too, so that we can solve the mufti issue".